I have studs on my snowmobile and still want to enjoy Minnesota's snowmobile trails. How does the metal traction device (stud) law affect me? Snowmobiles equipped with studs are welcome in Minnesota. However, you may not operate a snowmobile with metal traction devices on a paved public trail that is designated closed to such use by a local government with jurisdiction over the trail or on a paved state trail or any portion of a paved state trail that is designated closed to such use by the commissioner. A person operating a snowmobile with metal traction devices on any paved trail that is designated closed to stud use is guilty of a petty misdemeanor punishable by a fine of no more than $50 for the first offense, no more than $200 for the second offense, and no more than $500 for the third and subsequent offenses. The law restricting metal studs on paved trails was passed in response to concern about impact to roads, bridge decks, paved trails and private driveways crossed by snowmobiles with studs. Public paved trails account for less than two percent of Minnesota's extensive snowmobile trail system. Groomed, signed routes have been developed for snowmobiles with studs near paved trails that are closed to the use of studs. Non-metal plastic or nylon studs are not restricted. Is there a penalty for not complying with Minnesota's metal traction device law? Yes. Total fees assessed upon conviction for this offense may vary depending on where the offense occurred. 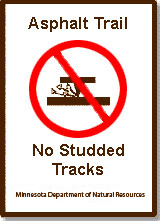 May I cut the studs off, without totally removing them from the track and still be in compliance? Yes, as long as they are shorter than the track. May I screw out the studs and put in plastic inserts to protect the threading? To order free copies of snowmobile regulations or statewide maps of snowmobile trails, contact the DNR Info Center.